Information about how to access your GIL account by creating a PIN number. Why do you need a PIN? In an effort to provide more security in accessing your account online, the use of a PIN has been implemented. Since the user determines the PIN, this helps insure the prevention of unauthorized access to your account. Viewing the list of items you have checked out. Reviewing the status of requested items. 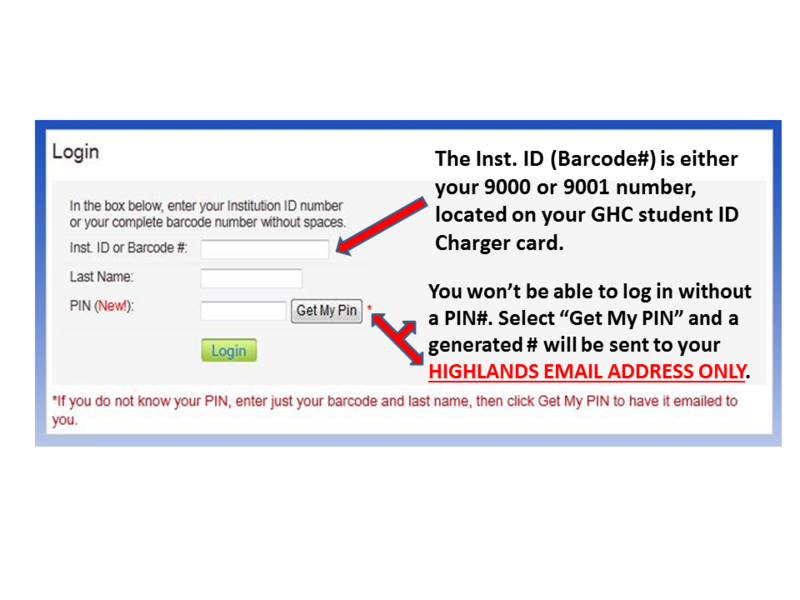 Enter your GHC Charger card ID number (9000# or 9001#). Click on the "Get My PIN" and a temporary number will be immediately emailed to your Georgia Highlands Email Account only. Once you have received your generated PIN#, log back into your account and re-enter your information. Remember to change your PIN! Click on the "Change PIN" button, located directly under your name & address in your patron account. What if you forget your PIN? What if you forget your PIN? You can use the "Get My PIN" link on the login screen to have it emailed to you. Please Note: Using Internet Explorer to change your PIN will cause the browser to hang up for a minute or so while completing the process. Firefox is recommended if possible because it does not have a delay.